Name tags are an often overlooked means of getting a lost bird back. Name tags are cheap, easy to make, easy to use, and have been responsible for a bird's return long after telemetry failed. Several falconers have had a bird returned hundreds of miles from the area it was lost, and some of those birds were returned weeks or even months after being lost. 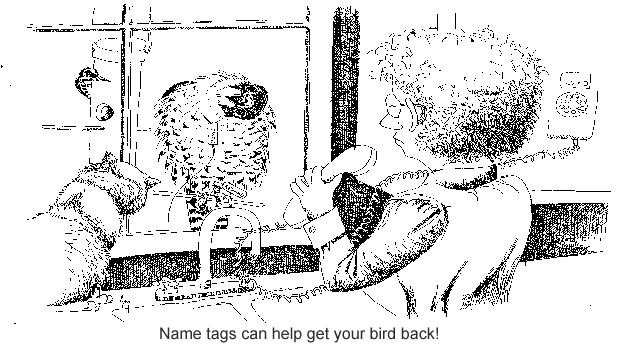 While it is true that a bird's chances of being returned because of a name tag are slim, if the bird has no tag, then the chances are practically nil. Some falconers make the mistake of assuming that the federal band can be traced back to them. A few states may have good enough organization to do so, but most do not, and even if they can track the owner of a bird, the process may take several days or weeks. Name tags with phone numbers can produce immediate results. As a minimum, tags should include the falconer's area code and phone number. "Reward" is also important because a finder may not recognize the hawk's value and may be reluctant to place a long distance call. Some finders may even be tempted to keep the lost hawk as a "pet". The incentive of a reward may spur these people (or one of their acquaintances) into calling the anxious falconer. Some falconers like to put their name on the tag, while others do not. There is really no good reason for putting a name on the tag and if it is left off, the phone number can be made that much larger and easier to read. All information should be printed on both sides of the tag. Don't assume that two single-sided tags are as good because they're not; the hawk may have one foot up with the blank side of the other tag facing out.